One of the nice features in Evernote that I use constantly is Note Links. With note links, you can create a link to any of your notes and put that link in another note or share it with others (we will talk more about sharing later). Creating a note link is easy - right click on the note in the note list and click Copy Note Link. Then paste this in a different note or application. 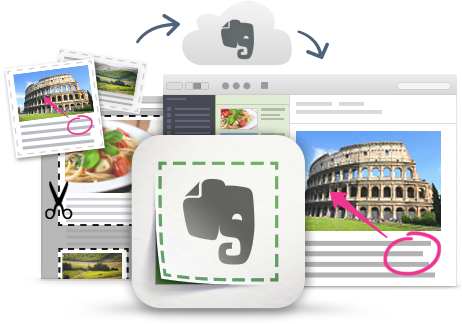 The links work across all Evernote apps. Lesson schedule - I have a schedule of my classes for each week and I just put the link to the lesson plan in that space. Project Management - projects can get very complicated and have tons of notes. I just link to each one from my project management main note. This includes links to my contacts notes (from business cards) and other project notes and resources. Lesson plans - each lesson plan has links to other notes, such as curriculum links, web resources I've clipped, and more. LESSON TITLE: Intro to Aircraft Design is the link to the lesson plan note with the lesson plan itself, objections, resources, and presentation. I can simply click the link in the schedule here and be taken to the note with everything I need.